SSJ: The new album is called Messin’ With The Blues. The title comes from a song by an old blues singer named Memphis Slim, a tune we cut for the CD. It’s a song I have wanted to do for a long time. There is another Memphis Slim song on the CD called Mother Earth. 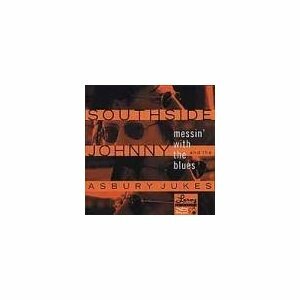 Is it a “Southside Johnny and the Asbury Jukes” album, or just “Southside Johnny”? SSJ: This is most definitely a Jukes album. Bobby (Bandiera), Jeff Kazee, Joey Stann, Chris Anderson, Eddie Manion, LaBamba, and Mark Pender all play on it. We used Garry Tallent on bass, as he was there as producer and we hadn’t settled on a permanent replacement for David Hayes, who was working with Van Morrison. The drummer is a nut called Chucki Burke, who drove me crazy, but played great! SSJ: There are 13 songs on the CD. I wrote some of them (with help! ), and the others are mostly old obscure blues and R&B tunes. Were your own songs written recently? SSJ: Only the songs Living with the Blues and Satan’s Shoes were written some time ago. All of the rest of my tunes were literally written in the studio… we’d just start to wail and I would sing and make up words as we went along. Later I would refine or rewrite the lyrics, and come back and sing the new words. It was a great way to make a record… you never knew what was gonna happen. Which songs are covers and what made you choose them? SSJ: Here’s a list of the covers with some notes on why I chose them. Messing Around with the Blues – A song recorded by the great blues singer, Memphis Slim. I first heard Slim do it on an old LP I bought for 98 cents in the mid-60s. This and the other Slim song on the CD, Mother Earth, were two of my favorite songs to sing for myself as I walked along the beach in Jersey. I used to practice on my one harmonica (that I had stolen from my brother), and sing to amuse myself. This is before I joined a band. At that time I had no ambition to be a musician, I just liked to sing. Come Home Little Girl – This one is from the B-side of an obscure 45. Garry and I were playing records from our collection, looking for material, and somehow this crazy thing jumped onto the turntable. Of course, as soon as we heard it, we knew we had to try it. We didn’t let the band rehearse, just played it for them once and said, “Let’s go!” By the way, that’s an old friend, Steve Conn, on accordion… he thought we were all out of our minds. River’s Invitation – This is another song I had heard a long time ago, but had forgotten. It’s by Percy Mayfield, a great singer/songwriter who was hugely influential back in the 40’s and 50’s. He was a favorite of Ray Charles, and I remembered the song when I found a copy of it (on Ray’s label) in our collection. I played it for Garry, and he said, “You gotta do that song!” So we did. Cadillac Jack’s # 1 Son – This was written and recorded by my favorite new songwriter, Kevin Gordon. It’s the title track of his terrific CD out on Shanachie records (plug, plug). I hadn’t planned on cutting it, but I wanted Kevin to play on the record because I loved the interplay he and Bobby had on guitar when we did the “acoustic” tour last year, if any of you remember that. So I asked Kevin, who lives just a few blocks from me, to come to the studio one night. When he got there, I, being me, couldn’t think of any of the songs we did on tour! So they all sat around staring at me ‘til I blurted out, “Oh, the hell with it…. do that &%#@% Cadillac song!” I didn’t even know the words; Kevin had to recite ‘em to me. Sinful – This is a song Garry wrote with Henry Gross. He played it for me on guitar, and I liked it enough to do it. Then, after we had cut it, Garry didn’t like it, so I had to convince him to put it on the record. No one can ever say this record is over-produced. Gin Soaked Boy – A Tom Waits’ tune. He’s my favorite not-new songwriter. A cheerful little ditty about stalking and revenge. Oh that Tom! SSJ: I can’t really say I have a single favorite. The thing I like most about this record is its tone. Garry knew that I wanted to try and capture the mood of all the classic blues I grew up listening to without it sounding like an academic exercise or a note-for-note recapitulation of some old 45. We did this by just letting the band play… no long rehearsals, not a lot of takes (3 at most) and a minimum of overdubbing. Some of the songs were just the germ of an idea, maybe a rhythm pattern or some chord changes, when we walked in the studio. Everyone contributed, and with musicians of this caliber who understand what you’re trying to do, well… good things happen. What inspired you to get back into the recording studio? SSJ: It’s been 8 years since the last record. I went through some bad times and really wanted never to record again. If you’re not in good mental shape, the studio is a torture chamber, as it was during the making of “Trash It Up.” Happily, after I moved to Nashville, I met some of the best people I have ever known, and I started to come out of my funk. And then there was Garry nagging at me. We had talked for years about making a record together and now seemed the time. He had finished up his last producing project, and had some free time. Of course, as soon as we got really involved, Bruce decided to tour with the E-Streeters! I think he was afraid of the competition. That bum! Apart from Garry Tallent producing the CD for you, who else was involved in the technical side of things? SSJ: The guy who really made it a joy to record was our engineer, Tim Coats. He’s a sharp technician with a great sense of humor (luckily for him). We all got along swimmingly once he realized I wasn’t truly that nasty; it was just my way of saying… “Hi! How the hell are ya!” He’s as playfully sarcastic as I am, so he understood my sense of fun. Were all of the songs recorded in the same place? SSJ: The basic tracks were done at Garry’s studio in Nashville, Moon Dog. John Bongiovi let us use his place in New Jersey to do the horns. Thanks, Dot and John. Has the fact that you’re living in Nashville had any influence on the style of this new CD? SSJ: The only influence Nashville has had is in giving me a place to regroup away from the duties and expectations of living in New Jersey. I love N.J., but sometimes you need to step away from what you know to open yourself up to what you don’t know… like, say, trigonometry. Overall, how would you describe the new CD’s musical genre? SSJ: I think it’s pretty clear by now that this a record heavily influenced by my love for blues. But it is not a CD of 13 slow songs. There are some raucous, rocking R&B tracks here as well. We cover a lot of ground as far as musical styles go, but it all is based on the blues. Are there any plans to do a promotional tour for the album and if so, will it include European dates? SSJ: I would love to tour for the next 2 years off of this album, but it will depend on the fan response. I am hoping to get back to Europe some time next year. Fingers crossed. How do you plan to market the new CD and will it be available through your Website, www.southsidejohnny.com? SSJ: Well, the plans for marketing the CD are still in flux. It will be available on-line, which I think is great because now anybody in the world can get the damn thing without a lot of hassle (I hope). We will also have it at the shows, and we are working on a distribution deal that will put it in some stores. More info about that will be on the Website as soon as it’s available. Who came up with the idea for the artwork? SSJ: The artwork is being done by Bob Delevante, a good friend of mine who is also a terrific singer/songwriter. Everybody in Nashville is a singer/songwriter… even me. The photos were taken by Lee Blankenship, and Michelle Paponetti, an artist I met at a show years ago, is coordinating the whole she-bang. What about the sleeve notes? SSJ: There are no notes on the CD itself. I plan to put all of that stuff on the Website. Maybe this will be it, as I had wanted to write something about each song. Judging from the interest in your Website and in the SSJ Digest, it seems that your fan base has been energized by the Internet. Has this had an impact on your career? SSJ: I think the Internet is a godsend for artists like me who don’t want to deal with record companies. It gives us a chance to reach all of the people who are or were fans, and it also is a great conduit to those who haven’t heard what we do. I also like the Napster idea. Who says rock stars have to all be millionaires, anyway? Isn’t it enough to spend a life making music? All the money in the world can’t buy you that feeling you get on stage, whether in a club in Jersey or in Wembley Stadium, when everything is right and the band and the audience are in sync. It’s… indescribable. Can your fans look forward to another New Year’s Eve with Southside Johnny and the Asbury Jukes? SSJ: My man Bill Durborow is working on something even as we speak… er… type.